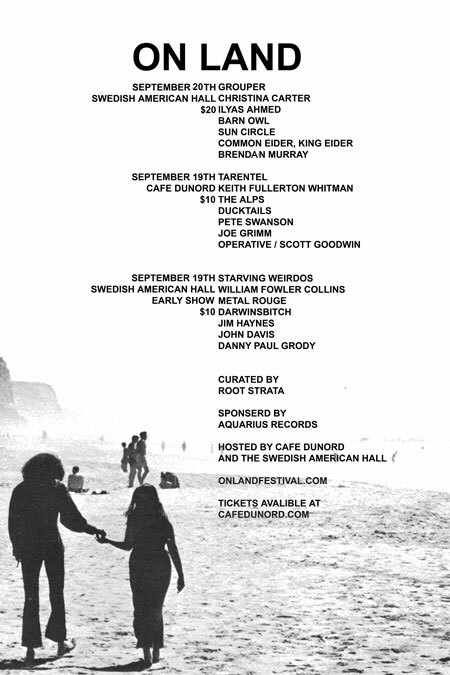 Root Strata Festival – On Land – September 19th / 20th – Tix on sale NOW! LIMITED FESTIVAL PASSES available for $35! Available only by calling Cafe DuNord box office (mon-fri, 2pm-6pm: 415-861-5016) to purchase over the phone!! We will probably need a few of volunteers, so If you are interested, please get in touch! Damn it! Why the hell do I live on the East Coast?? And why is this in September?? I can’t really think of a better lineup. This is something I would seriously fly out for if I wasn’t in school. Oh well, hope all who are lucky enough to go have a blast. Thanks for getting KFW, very excited! nice, can’t wait to see everybody and especially the alps and tarentel. these will be three great days! i chose a hell of a time to move to maryland… im sad to be missing this!